Barrel horses rarely go without horseshoes. Horseshoes function by protecting the hoof wall from wearing down due to the heavy impact and concussion that is an unavoidable part of running barrels. Aluminum shoes have both advantages and disadvantages that you should consider before you make a final decision on the type of shoes you want to use. The amount of work your horse does and the level at which you are competing will affect your decision. Horseshoes are U-shaped pieces of metal designed to fit on the underside of the horse's hoof. Horseshoes protect the wall of the hoof from damage. The shoe is placed on the bottom of the hoof by the farrier, a professional who maintains horse hooves, and nailed into the hoof wall. Horseshoes can be made out of of an assortment of materials, but aluminum and steel are the most common types. Aluminum shoes have steadily increased in popularity over the last several decades. 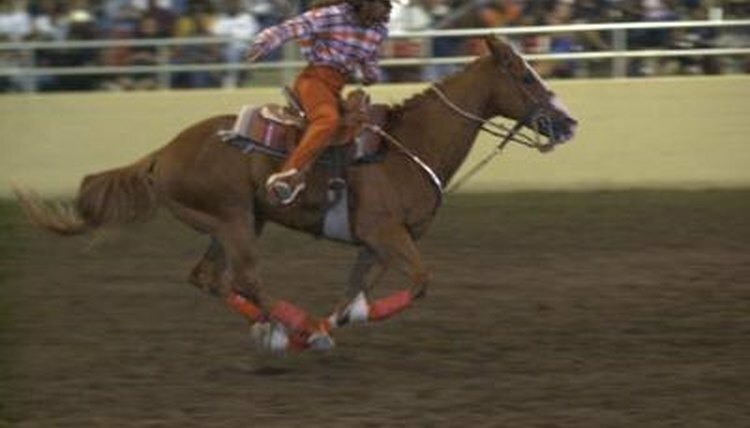 Aluminum horseshoes offer several benefits for horses used in barrel racing competitions. Aluminum horseshoes are lighter than steel horseshoes. They have a more natural feel for the horses wearing them. Barrel horses need to be light on their feet and aluminum horseshoes help, especially in national and world-level competitions. Horses wearing aluminum shoes have less lower-leg action. Horses with thin or weak hoof walls may also be more comfortable in aluminum shoes because the lighter weight will put less stress on the hoof wall when they are nailed on. Aluminum horseshoes wear down more quickly than steel horseshoes. If your horse is being used in a lot of competitions and you practice every day of the week, your aluminum shoes may not hold up to the wear and tear your barrel horse puts on them. If your horse is competing at high levels, you may want to consider shoeing your horse more frequently so that your horse's shoes will not wear down too much. Aluminum horseshoes also cost slightly more per shoe than steel shoes. Aluminum shoes normally wear down too much to be used for more than one shoeing, which means that you will not be able to reuse the shoes the next time your horse has his hooves trimmed.